I was wandering through one of the Very Large Corporate Bookstores the other day, because I needed something to do for an hour, and because they happen to have a really wonderful magazine section. I hardly ever get to the actual books when I go there. There are too many. I get confused. I went in for a new notebook (I bought four), and I spent some time with the fancy magazines too. 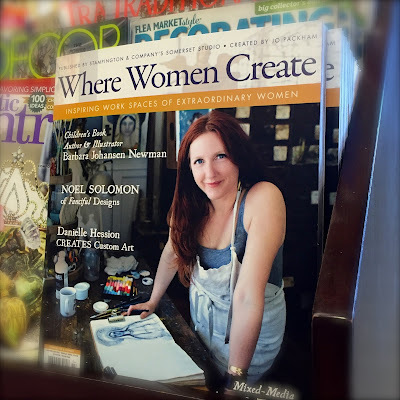 I like to flip through the expensive $15 "collectible" Somerset publications from Stampington and Company, like Artful Blogger, Willow and Sage, and Where Women Cook. They're more like books than magazines, and I usually find them beautiful and inspiring, and worth a visit to that particular store. Are you sensing a But here? Yes. But, when I picked up a copy of Where Women Create, instead of feeling inspired and happy, I felt... really pissed off. Page after glowing page showed happy, prolifically creative women, with perfect hair and makeup, in their perfectly chaotic sanctuaries of art, as if they are separate and different and somehow more valid than the most-of-us who create all manner of things in regular, everyday, mundane spaces. I'm still annoyed. Get this. Every single one of us is creative by nature. (Not just women. Men too, of course, but I'm focused on the women today.) We don't all make "art" of some kind, but simply living requires huge amounts of creativity, and living happily takes even more. Don't believe me? Make a list of all the creative things you do. Most of the mundane little things we do, from getting dressed, choosing the right shoes and jewelry, and making breakfast, to plotting a course to work, school, shopping, whatever, and just generally getting through another day as an inhabitant of this planet, is a creative effort. We have to keep figuring things out, over and over again. That's creativity. There doesn't have to be a shiny handcrafted bauble at the end of the day. There only has to be you. For those who do create actual "things," like art or writing or cooking or sewing or whatever, most of us know that having the perfect creative space is not a requirement, and often not even an option. If you think it is, and not having that space is stopping you from Making Stuff, drop that silly notion right this minute and get yourself to the art supply store of your choice. My first beadmaking "studio" was a small round table in the corner of my kitchen. The next one was a cold, damp laundry room attached to the carport. I eventually upgraded to another cold/damp, or hot/sweaty, depending on the season, space that connected to the back door of our house in Taos, and was basically a passthrough for my family when they needed tools from the half of the room I wasn't using, or had a clean load of laundry to take out to the clothesline, or a dirty load of firewood to squeeze past me in a wobbly wheelbarrow and dump on the floor behind me. Sure, we all referred to it as "my" studio, but it was far from being any kind of sanctuary. I used to long for a space that was really my own, that was orderly and colorful and as beautiful as the ones in the magazine. It never happened, and I made stuff anyway. I still do. These days, here in Portland, the studio apartment I share with Rick is also my "studio." More specifically, a counter-height table we bought at Ikea, that we use for cooking, eating, and game nights, is also my humble, and perfectly functional, studio. I can leave it in my kitchen area, or slide it over a few feet to the window when I want better/different light. In this studio, I write, draw, create blogs and websites, make jewelry, teach jewelry making, photograph, knit, crochet, create coloring books, and sometimes, I even cook. And the best part is, I no longer wish for a bigger or "better" space. Much as some people will tell you that every space is sacred space, all land is holy land, and all water is holy water, I'm telling you that all space, any space you can utilize, even temporarily, can be creative space. If you want to make something, and you've been waiting for the perfect little studio to inspire your dreams and spark your creativity into a bonfire, forget about it. That perfect space might never happen. I once worked with glass and fire in a tent. Yep. Outside, in winter, with snow and wind blowing all around the flaps, and in summer when it was so hot I could barely breathe. I made it work, because it was what I had. Do it now. Make it now, wherever you are, with whatever you've got. As creative beings, we can also create the time and space to make the things that want to be made. And stop buying magazines that only make you feel inadequate and underprivileged. Where do women really create? First in our hearts and heads, and then in any old place we please. Good thoughts. Nothing stops creativity once a person no longer listens to everyone else telling her "it must be this way". So brilliant and empowering! Love this. I remember seeing that tent at Emigrant Lake, and being amazed at the beauty you were creating there.